Previous Article Drama was hot off the Press! 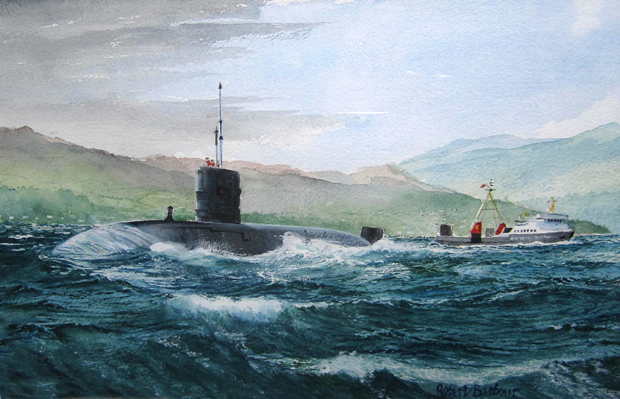 A TRIDENT submarine from Faslane seemed an unlikely subject for a painter in watercolour. But Rhu artist and architect Robert Barbour, who died on January 31 2012, was up for the challenge. His painting simply entitled ‘Trident’, was the result, and it can be seen in this year’s Anderson Trust (Local Collection) exhibition ‘Sea Lochs and Rivers’ upstairs in Helensburgh Library in West King Street. It was purchased by the Anderson Trust the year after the artist’s death, and the following year his widow Pam donated a second work, ‘HMS Superb’s Last Patrol’, to the Trust. In an obituary published in the Herald in March 2012, John Wylie wrote: “Robert Barbour, who has died aged 74, was a highly talented architect and artist, specialising in watercolours. He was born in Glasgow, where the family lived in Knightswood, on April 20 1937, and attended Bankhead Primary School. Later he attended the now long-gone Victoria Drive Senior Secondary School in Scotstoun, which he used to jokingly refer to as VD but where he passed his highers. At school he showed early promise in drawing and painting, a talent that he was later to use fully. His father was the chief draughtsman for Simon and Lobnitz, builder of dredgers at Renfrew, and Robert inherited his father’s skill in design and draughtsmanship. After leaving school he joined Jack Holmes and Partners as an apprentice architect, studying at Glasgow School of Art and the Technical College, now Strathclyde University. He graduated in 1961, and after qualifying as an associate of the Royal Institute of British Architects and joining the Royal Incorporation of Architects in Scotland, he became involved in a number of major projects including the construction of the award-winning multi-storey flats at Anniesland. Later, as a partner with architects King, Main and Ellison, he had responsibility for the landmark Scottish Amicable building in Glasgow’s St Vincent Street, Glasgow. He was also involved with the Corunna House office development at 27-29 Cadogan Street in Glasgow and the Barbican Building in London. Between his time with Jack Holmes and King, Main and Ellison, he worked for some two and a half years from 1970 for Lambert and Innes at Pulls Ferry, Norwich. One of their clients was Colin Chapman of Lotus Cars whom he got to know very well, and this added to his interest in racing cars and linked to his development of a large model car collection. He was a regular attender at Formula 1 races at Brands Hatch and Silverstone. His own sporting activity was sailing, having spent many happy times on the water at Millport where his parents had a holiday house. 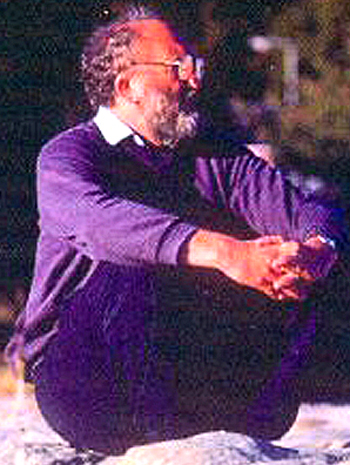 When he moved in Helensburgh in the late 1960s with his first wife, Pat, he was an enthusiastic boat owner, competing regularly in regattas at Helensburgh Sailing Club. This interest resumed when they returned to Glasgow from Norwich in 1972. But when his marriage broke up in 1986 he moved back to Helensburgh the following year for several months. In 1988 he married Pamela Carol Walker and was happily married to her for 25 years. They made their home in Rhu where they set up Summerhill Studio in Church Road and he ran an architectural practice. As a schoolboy he used to go plane spotting at the old Renfrew Airport when British European Airways flew Dakotas, Vikings and Dragon Rapides in the 1950s. Renfrew was also the base for the RAF City of Glasgow 602 squadron flying Meteors and Vampires. When he developed his skill as an artist painting in watercolours, his early aviation and sailing interests provided him with a wide subject base, as did his work as an architect. In later life he gained wide recognition as a watercolourist, exhibiting with the Eastwood Six when he lived in Clarkston, with his own exhibitions, and with Helensburgh Art Club when he lived in Rhu. His paintings covered a varied range of subjects including landscapes as well as ships and trains and planes, and in later life he developed his art in more abstract form. 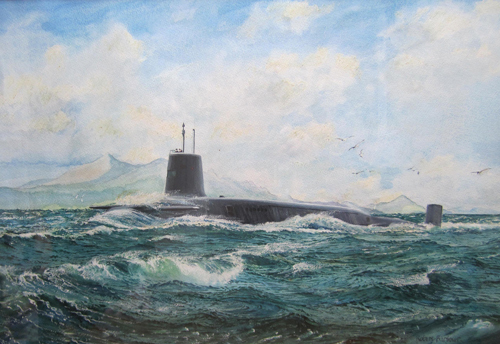 His interests in fighter aircraft led him to gain commissions for paintings for the officers messes at RAF Leuchars and Honnington, while his interest in maritime subjects meant his paintings of submarines also hang in the wardroom at the Clyde Naval Base at Faslane. A member of Glasgow Art Club, the artist was delighted when the club presented the Queen in her Silver Jubilee year with his painting ‘HMS Bronington’ to recognise Prince Charles’s first Royal Navy command. He also painted the last official picture of the Royal Yacht Britannia while she was in service, and went on board when she was in Glasgow. He loved being able to say he had been aboard her and loved looking around. Many prints of his paintings have been made available from websites — including Rhu-based Cranston Fine Arts — and he gained an international reputation as a watercolourist. His professional career only ended when he became seriously ill. He continued to undertake small commissions well into his 70s. John Wylie wrote that he was a dedicated family man who simply enjoyed having all his family around him. Within his family he was affectionately known as Rob, but the grandchildren loved to call him Beardy because he sported a beard in later life. He was well loved and respected, and had a wide circle of clients and friends. He was survived by his wife Pam, who died last year at the age of 73, son and daughter David and Fiona from his first marriage, his stepsons John, Russell and Finlay, and several grandchildren. The Anderson Trust collection has two of his naval paintings. ‘Trident’ shows the submarine leaving the Gareloch and was purchased in 2013. In 2014 Mrs Barbour donated ‘HMS Superb’s Last Patrol’ to the Trust.